Two-time winner of the Pulitzer Prize David McCullough tells the dramatic story-behind-the-story about the courageous brothers who taught the world how to fly: Wilbur and Orville Wright. On a winter day in 1903, in the Outer Banks of North Carolina, two unknown brothers from Ohio changed history. But it would take the world some time to believe what had happened: the age of flight had begun, with the first heavier-than-air, powered machine carrying a pilot. Who were these men and how was it that they achieved what they did? David McCullough, two-time winner of the Pulitzer Prize, tells the surprising, profoundly American story of Wilbur and Orville Wright. Far more than a couple of unschooled Dayton bicycle mechanics who happened to hit on success, they were men of exceptional courage and determination, and of far-ranging intellectual interests and ceaseless curiosity, much of which they attributed to their upbringing. The house they lived in had no electricity or indoor plumbing, but there were books aplenty, supplied mainly by their preacher father, and they never stopped reading. When they worked together, no problem seemed to be insurmountable. Wilbur was unquestionably a genius. Orville had such mechanical ingenuity as few had ever seen. That they had no more than a public high school education, little money and no contacts in high places, never stopped them in their “mission” to take to the air. Nothing did, not even the self-evident reality that every time they took off in one of their contrivances, they risked being killed. 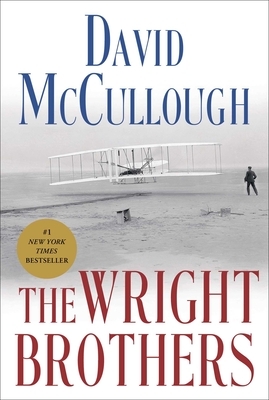 In this thrilling book, master historian David McCullough draws on the immense riches of the Wright Papers, including private diaries, notebooks, scrapbooks, and more than a thousand letters from private family correspondence to tell the human side of the Wright Brothers’ story, including the little-known contributions of their sister, Katharine, without whom things might well have gone differently for them. David McCullough has twice received the Pulitzer Prize, for Truman and John Adams, and twice received the National Book Award, for The Path Between the Seas and Mornings on Horseback. His other acclaimed books include The Johnstown Flood, The Great Bridge, Brave Companions, 1776, The Greater Journey, and The Wright Brothers. He is the recipient of numerous honors and awards, including the Presidential Medal of Freedom, the nation’s highest civilian award. Visit DavidMcCullough.com. “Few historians have captured the essence of America — its rise from an agrarian nation to the world's dominant power — like David McCullough. . . . McCullough has defined American icons and revealed new dimensions to stories that long seemed exhausted. . . . An elegant, sweeping look at the two Americans who went where no others had gone before and whose work helped create a national excellence in aviation that continues today." "McCullough’s magical account of [the Wright Brothers'] early adventures — enhanced by volumes of family correspondence, written records, and his own deep understanding of the country and the era — shows as never before how two Ohio boys from a remarkable family taught the world to fly." "McCullough vividly re-creates the failures and disappointments as the Wright brothers puzzle out the scienceof bird- and insect-wing design. . . . [McCullough] continues to deliverhigh-quality material with familiar facility and grace." "An outstanding saga of the lives of two men who left such a giant footprint on our modern age." "[A] fluently rendered, skillfully focused study. . . . An educational and inspiring biography of seminal American innovators." "McCullough's usual warm, evocative prose makes for an absorbing narrative; he conveys both the drama of the birth of flight and the homespun genius of America's golden age of innovation." "Pleasurable to read. . . . McCullough has a gift for finding the best in his subjects without losing perspective on their flaws."